New Yorkers joined together as a community before Hurricane Irene in order to take down thousands of 9/11 “Memorial Titles” that decorate a fence in Greenwich Village in order to protect them and bring them to the World Trade Center site. Last week, the CSX Corporation, a leading transportation company in the United States, prepared for the damaging effects of Hurricane Irene by not just thinking about the company’s own interests, but also of the communities it serves. 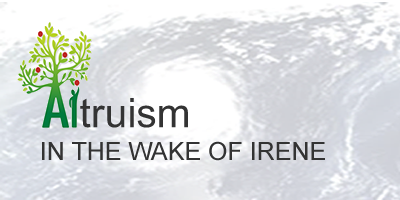 How have you impacted others in the aftermath of Hurricane Irene? say kudos for a marvelous post and a all round entertaining blog (I also love the theme/design), I don’t have time to browse it all at the minute but I have book-marked it and also added in your RSS feeds, so when I have time I will be back to read a lot more, Please do keep up the fantastic job. Thank you! We are glad you enjoyed the post and hope you join us in sharing the good you do and sharing stories that inspire you. Together we can increase altruism and social impact! Thanks again for your kind words.